As was forecast, working capital on farms decreased during 2015 (see farmdoc daily, October 6, 2015). Given 2016 income prospects, further decreases in working capital should be expected. At the end of 2016, most of the working capital reserves built during high-income years from 2007 to 2013 will be gone. Working capital levels will again be at levels comparable to 1996 through 2006. In 2015 and 2016, working capital reserves were used to fund cash flow shortfalls coming from operations. If prices remain low through 2017, means other than reducing working capital likely will be needed to address cash shortfalls. 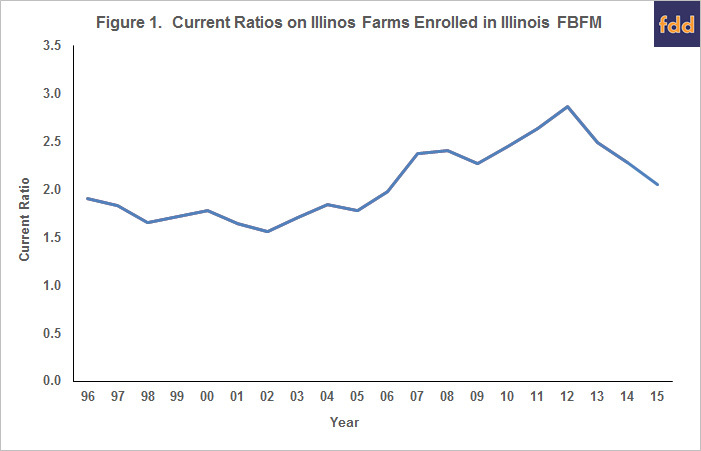 Figure 1 shows current ratios averaged for Illinois farms enrolled in Illinois Farm Business Farm Management (FBFM) who completed usable balance sheets. A current ratio equals current assets divided by current liabilities. Current assets include cash and cash equivalents; crop, feed, and market livestock inventories; and prepaid expenses. Current liabilities include operating loans; current portions of longer-term debt; accounts payable; and accrued items such as income taxes. A current ratio measures the farm’s ability to pay back short-term liabilities with short-term assets. Ratios below 1.00 suggest that a firm will be unable to pay back its obligations without resorting to financial restructuring. Having additional abilities to meet obligations, as indicated by having higher current ratios, is desired. A textbook benchmark for an acceptable current ratio is something above 2.00. From 1996 to 2006, low profit margins existed on most Illinois farms, and the current ratio averaged 1.76 (see Figure 1). Between 2006 through 2012, the average current ratio increased, reaching a high of 2.87 at the end of 2012 (see Figure 1). From the 2012 high, the current ratio decreased: 2.49 at the end of 2013, 2.28 in 2014 and 2.05 in 2015. 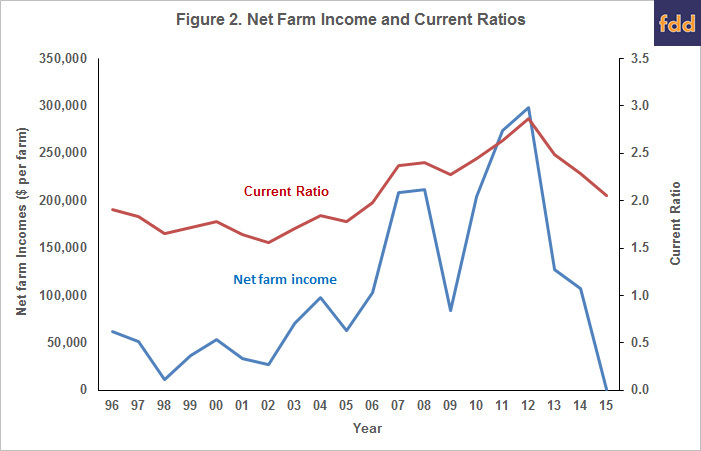 Changes in these current ratios are highly correlated to net farm incomes (see Figure 2). During the period between 1996 through 2002, net income averaged $39,000 per farm on grain farms enrolled in FBFM. During this same period, the current ratio averaged 1.72. Net incomes were higher in 2008 to 2012, with increasing net incomes from 2010 through 2012. The highest net income of $298,000 occurred in 2012, the same year that the current ratio hit its maximum of 2.87. Since 2012, incomes have decreased and current ratios have decreased as well. The correlation coefficient between average net farm income and the current ratio is .88. Net income on grain farms enrolled in FBFM averaged $500 per farm in 2015. It is reasonable to expect low net farm incomes in 2016, likely somewhere near $10,000 per farm. Net incomes at this level would result in another decline in the current ratio. If the decrease was the same as last year, the current ratio will be 1.81 at the end of 2016, near the 1.76 level that occurred between 1996 through 2006. Evaluating the specific components causing working capital to change over time is useful. Figure 3 shows major current asset categories of the current ratio. Decreases in current assets result in lower current ratios. Figure 4 shows the major liability categories of the current ratio. Increases in current liabilities reduce the current ratio. Somewhat surprisingly, cash balances have remained relatively constant in recent years: $242 per acre in 2014 and $255 per acre in 2015. On average, farmers have not reduced cash. Rather working capital changes have occurred elsewhere. Current ratio decreases have come from two major categories: 1) decreases in crop inventories and 2) increases in operating loans. Crop inventories averaged $628 per acre at the end of 2014 and $539 per acre at the end of 2015, a decrease of 14%. Some, but not all of this decrease occurs because of lower prices used to value crop inventories. In valuing inventories, FBFM used corn prices of $3.75 at the end of 2014 and $3.60 per bushel at the end of 2015, a 4% decrease. Soybean prices for inventory purposes were $9.81 at the end of 2014 and $8.60 at the end of 2015, a 10% decrease. Both the 4% corn price decrease and 10% soybean price decrease were less than the 14% crop inventory decrease, indicating that farmers had lower bushels in grain inventories at the end of 2015 as compared to the beginning of 2015. 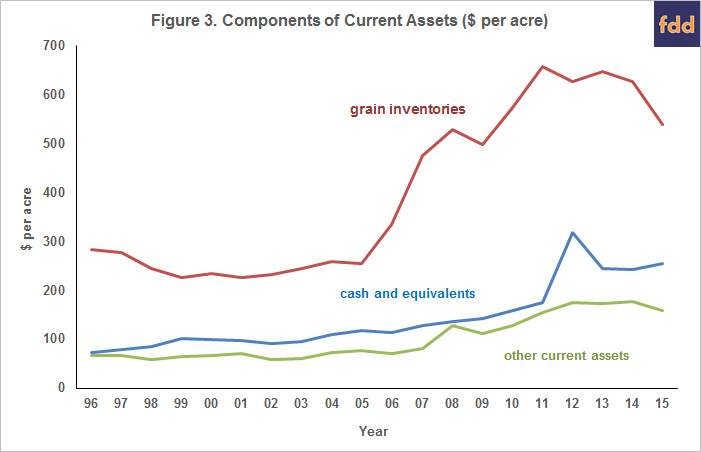 Hence, the crop inventory decline is not solely due to prices, but also because physical inventories have decreased. Operating note balances increased from $303 per acre in 2014 to $315 per acre in 2015. 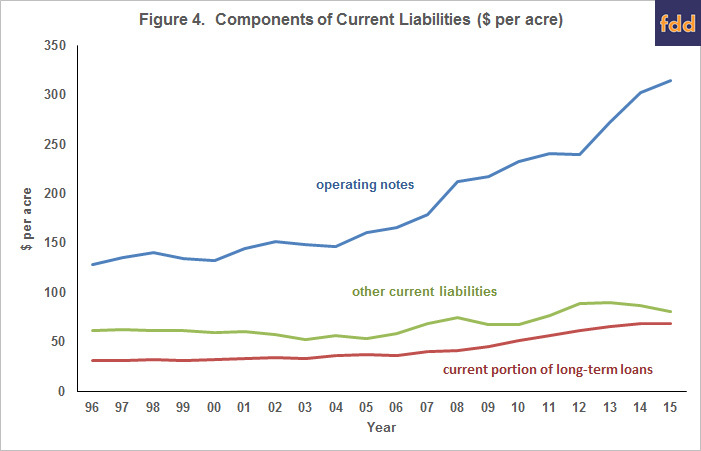 The other components of current liabilities have remained relatively steady. So far, much of the financial adjustments occurring on Illinois grain farms have occurred in two areas: lower grain inventories and increasing operating notes. In the sections above, averages for working capital have been presented. There will be large variations in working capital across farms as previous decisions will impact current levels of working capital. Moreover, some of these differences are structural. For example, current ratios tend to decrease with less farmland owned. For example, farms that own less than 10% of their land had a current ratio of 1.78 at the end of 2015. The 1.78 ratio compares to a 2.33 a ratio for farms that own between 26 and 50% of their farmland. More detail on how financial ratios vary by farm type is available in the Financial Benchmark Section of farmdoc. Overall, reductions in working capital do not necessarily signal a time of financial stress in agriculture. Incomes will be low in 2016; however, most farmers will have the financial reserves to deal with cash shortfalls. Many farmers will again reduce working capital. However, working capital reductions could present issues in the future. After the end of 2016, many farms will not have large working capital reserves compared to historical levels. If 2017 is a low-income year, cash shortfalls will again occur. Working capital reserves may no longer be large enough to cover cash shortfalls. Farmers may have to use other methods of meeting cash shortfalls including 1) refinancing short-term debt into longer maturity debt and 2) liquidating assets. Lenders may seek FSA guarantees for operations that are becoming financially questionable. A gauge of whether low incomes will continue are commodity prices. As long as corn prices remain below $4.00, working capital and financial situation on grain farms in the Midwest can be expected to deteriorate. More rapid deteriorations will occur with lower commodity prices. Large cash shortfalls will occur on most farms when corn prices are $3.50 per bushel or below. How many years of prices below $4.00 is an open question. At this point, it seems reasonable to expect low incomes into 2017 as bid prices for corn in the fall of 2017 are near $3.50 per bushel. Hence, continuing cuts in non-land costs and rents are in order. farmdoc. "Financial Benchmarks." Department of Agricultural and Consumer Economics, University of Illinois at Urbana-Champaign, accessed September 20, 2016. Schnitkey, G. "Significant Reductions in Working Capital Likely in 2015 on Grain Farms." farmdoc daily (5):184, Department of Agricultural and Consumer Economics, University of Illinois at Urbana-Champaign, October 6, 2015.